The Fifth Edition is completely updated from the Fourth (2005) editions. 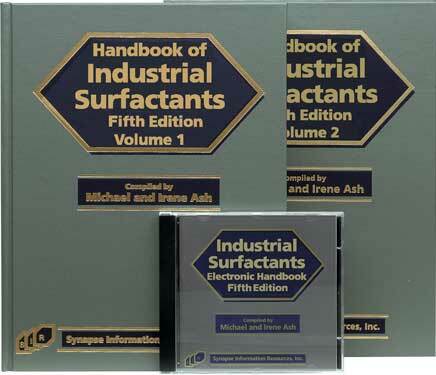 This reference is the standard source for anyone involved in the formulation, research, marketing, or procurement of surfactant materials. Click and Go Table of Contents: Left Pane Explorer-like icons enable you to instantly go to any section of this Title or any other installed Synapse Chemlib products. Hyperlinking: Trade name manufacturers to Manufacturers Directory and Generic chemicals to Generic Products, Trade Name Cross-Reference, Trade name manufacturers to Manufacturers web sites. Hyperlinking: Trade names to Trade Name Reference, generic manufacturers to Manufacturers Directory, all cross-references (synonyms) to main entries, Generic manufacturers to Manufacturers web sites. Part IVFunction/Application Index is a powerful tool for locating chemicals based on functions and industrial application areas. By searching for functional key words such as defoamer, emulsifier, dispersant, wetting agent or application key words, such as oil field, coatings, water treatment, .etc, the user is directed to the trade names and/or chemicals that have that specific functional/application attribute. Part VManufacturers Directory contains detailed contact information for the more than 4,000 manufacturers of the trade name products and generic chemicals that are referenced in this source book. Wherever possible, telephone, telefax, toll-free telephone numbers, Email and Internet addresses, and complete mailing addresses are included for each manufacturer. contains detailed contact information for the more than 4,000 manufacturers of the trade name products and generic chemicals that are referenced in this source book. Wherever possible, telephone, telefax, toll-free telephone numbers, Email and Internet addresses, and complete mailing addresses are included for each manufacturer.